I know the smoke and steam of industry. Tall chimneys, the cordons of terraced houses. Shift changes: men in caps and thick jackets leaving or returning home in the dark. … and through empathy and compassion for hope forbidden and lost. ‘The past is a foreign country; they do things differently there.’ The immortal first line of L.P. Hartley’s The Go-Between wistfully illustrates our relationship with memory: what we remember, what we think we remember, what is known, what can’t be known. But as writers we keep on visiting our foreign countries and its inhabitants. We keep on telling our stories, sometimes to make sense of things, other times to simply bear witness. And we tell the stories of people who, for so many reasons, may not have had a voice. ‘What’s the word for the sky in your house?’ my granddaughter asked as I was putting her to bed. ‘The sky in my house?’ And I looked up towards the ceiling, imagined the open space above it, between floor joists and the roof’s wooden rafters, and I saw what she was seeing, saw it confined there as if it had forgotten to move before we’d converted the derelict barn to a home. ‘Ah, the attic,’ I said. Fifteen years later I live in a house with no attic and sometimes I stare at the sky and wonder about all that time it was living with me and I hadn’t known. discover (v.) from the Old French descovrir, which meant, satisfyingly in the above context, to unroof, and also to unveil, to reveal. We discover things when we lift the veils of self-importance, fear, indifference, cynicism, intolerance, impatience. We discover things when we do not assume we already know everything. 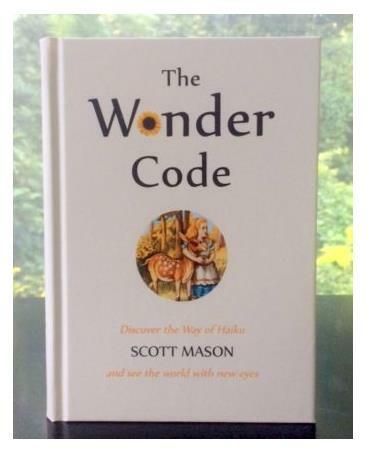 The Wonder Code is many things: a guide to writing haiku, a meditation on haiku practice, an anthology and a philosophical manifesto. It is also a tribute to the 285 poets whose work appears here, collated from the pages of the American haiku journal, The Heron’s Nest. The haiku, presented in five separate ‘Galleries’, with a sixth gallery showcasing Mason’s own work, are introduced to us through a series of reflective essays. 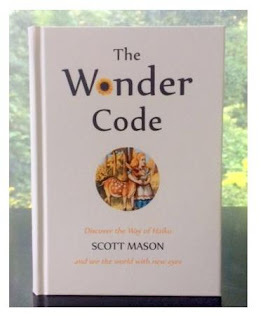 The Wonder Code is a compact but enjoyably heavy book that opens comfortably in one hand. Its satin boards and yellow endpapers are as charming and cheerful as smiles. The font and text-size are easy on the eyes. And Mason is a writer with his readers’ interests at heart. He is serious without ever being solemn; he is informative and celebratory. And his own haiku illustrate an absolute engagement with the deceptive simplicity of haiku writing: the challenge of creating two parts that ‘ignite’ and produce the startling heat of veracity. My granddaughter was a city kid, more at ease with London’s squalling traffic and hurly burly streets than the unfamiliar quietness of woodland tracks, the distant horizons of open fields. Each visit to our house in the countryside led to discoveries: the sound of woodpeckers, a camp made with fallen branches, the persistent tingle and itch of nettles, and once, on a trip to a local farm, the petting of a lamb. ‘It feels like porridge,’ she exclaimed as she ran her palm across its tight woolly coat. 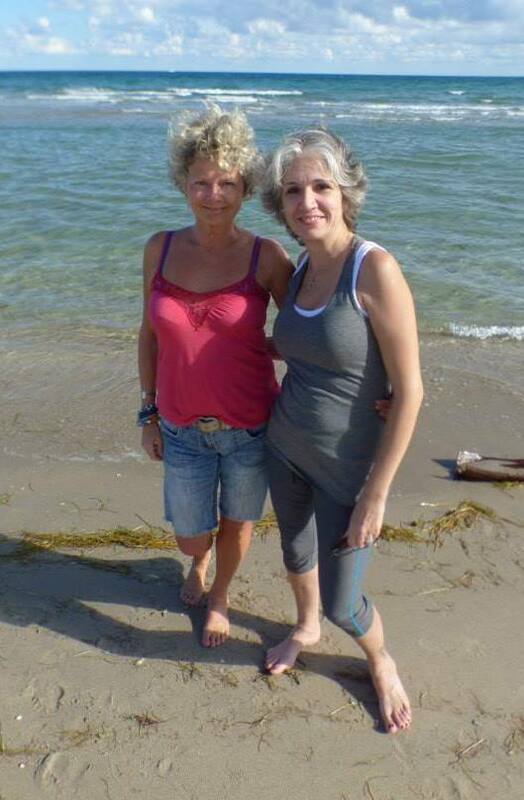 This week a friend on Facebook shared an old photograph of us, standing together on the shore of the Atlantic on Florida's east coast, and I felt homesick for the sensation of damp sand under my feet, for the scent of salt on the breeze. I was born next to the sea in South Wales. The beach and sand dunes were our playground as children. The sound of breaking waves became so familiar I had to focus intently to hear them at night before I fell asleep. The knots of sand in the title of Rowlands' haiku collection are the ropey-looking burrowings that lugworm leave on the surface of the sand. My dad used to dig for lugworm, to use as fishing bait, on the beach at low-tide. cylymau tywod in Welsh, my mother's first language, the language we were not taught growing up in Port Talbot (for outdated reasons about learning) but one that still formed a natural part of my life: spoken during family visits in Llanelli, my parents' hometown, used in Welsh school plays on St David's Day, in the hymns and songs we learnt for assemblies and concerts, for the 'O' and then 'A' level I took at Sandfields Comprehensive School. So many of the haiku in this book bring me back to myself through the sea and through language. Rowlands' experiences and responses are transposed through emotional engagement and acts of imagination into my own. ... a memory from February 1963 of my four year old self leaning over the back of a deep red Rexine settee watching the streets and roads blanketed with heavy snow. I enter his house of words and find the gift of myself at home. We are all connected through our common sensory experiences, by the way we see, hear, taste, smell and touch the world. And by what we feel for each other too. This week we have tree-fellers cutting the tops off the leylandii that stretch for 300 meters along the lane, flanking our 20 acre apple orchard. There is a tractor and mower to keep the grass down. But this year there will be no pickers and bins, or any flat bed lorries loading the harvest, since the company who've been renting the orchard, and juicing the fruit, pulled out in January. It's an old orchard that wasn't planted in regulation rows or to modern agricultural preferences for variety and design, so it's no longer economically viable for them. And, as if the trees themselves know it, the crop so far looks sparse, patchy. "It's a summer of lasts/"
We are still graced with the visits of wild deer. We have wild pheasants ("...not the brightest, scurrying, flapping/" from 'Pheasants' p.8), rusty and honey coloured foxes. We have the odd clambering hedge of wild hops from the orchard's previous incarnation. Last year I found the ragged remains of a balloon from a school in Essex and a card asking me to let them know where it had been found. I once came across a buzzard its wings fanned over the grass in the corner nearest the woods, so perfect it looked as if it had fallen asleep in the sky and plummeted to earth. We have never had a boat, as McCarthy's orchard once had. And our orchard has not been neglected but farmed continuously since the 1960s. And it's highly improbable, at least in my lifetime, that houses could be built here But it still feels like the end of an era. And it's the themes of 'endings' and being poorer for what's lost that percolate McCarthy's collection: disappearing cherry orchards, the loss of an inspiring view, the absence of seasonal visiting sheep, and the urbanisation of green fields accompanied by the inevitable decline in wildlife: rabbits, woodpeckers, kestrel. So the threads of resentment and sadness throughout many of the 25 poems are to be expected. In 'Eden Village', a housing estate built on a former cherry orchard, the children do not play in the natural paradise suggested by the title but "are in their rooms playing games." In 'Strange Fruits' the hedgerows are littered with "Stella cans, a Co-operative bakery wrapper/". But despite this tone and detail I do not leave this collection feeling bereft or hopeless and that may well be down to McCarthy's lyrical language and syntax which, like the pheasants in the previously mentioned poem, are often "Joyous miracles." In her previous urban home, "The quarter hours chimed with stolen light." (from 'Prologue' p.1). Her home-made bunting survives, "Rain and shine, rain and shine;/ washed and dried, washed and dried." (from 'Drought' p.11). And I'm particularly comforted by the poplars in the final poem, "Last" that "shush as they bend." Because isn't this how humanity moves forward with grace? By noticing the beauty in ordinariness? By accepting what cannot be changed? By bending but not breaking? And by celebrating and commemorating both past and present, its joys and griefs. Four years ago we dug up the concrete yard between our house and the main orchard and planted a small private orchard of conference pears and stone fruit. This year's harvest of cherries was the best: you can see some nestling against McCarthy's collection in the photograph above. The pears and plums too are full of promise. As are the peaches. The nectarine trees have been playing a 'falling' game with us, dropping fruit in what we thought was natural pruning on two occasions, but leaving us fearing the worst on the third. We may have a handful. And all those acres of apple trees? We do not know yet. But we will carry any loss along with the possibilities of new horizons. We will keep walking forward.